Do you have difficulty pulling a decorating scheme together? Do you have so many ideas that you never know which one to use? Love too many things or simply have no idea where to begin? Knowing where or how to start when you are going to update or completely change your decor can be really daunting. Over the last few months I’ve been on one big virtual shopping trip whilst writing this blog and suddenly find myself with loads of inspiration. But that’s taken quite a bit of time, which many of us simply don’t have. Well one way to gather some ideas together and help visualise the end result is through a Mood Board. Bring together your favourite pieces, try out how different fabrics and prints will look or simply get a feel for the kind of look you want to create in your latest decorating experiment. You can cut out pictures from magazines, print off the internet or do what I’ve done – try a free online Mood Board Creator! I’ve discovered Olioboards where you can drag and drop furniture, fabric, wallpaper, decor and accessories to create the look you are dreaming of! Great fun. And if you’re in the States you can even shop your look online too. I gave it a go and here’s my first creation. I was aiming for a retro Mid Century look with the paper and then built it from there. I like experimenting with different prints and fabric but my ‘matchy matchy’ brain struggles with this. The board creator is a fab tool for me in this case, and lets me virtually try it all out and gives me some confidence that my look will work! I’m not sure I’ve got the proportions quite right though. The creater lets you alter the size, flip or flop the image and pull it to the front or the back. It’s my first attempt and it’s certainly not perfect. If you look closely, you can see I’ve added in a pendant light fitting but it’s a little obscured by the busy wallpaper print! I’ll do better next time. Or maybe you would? 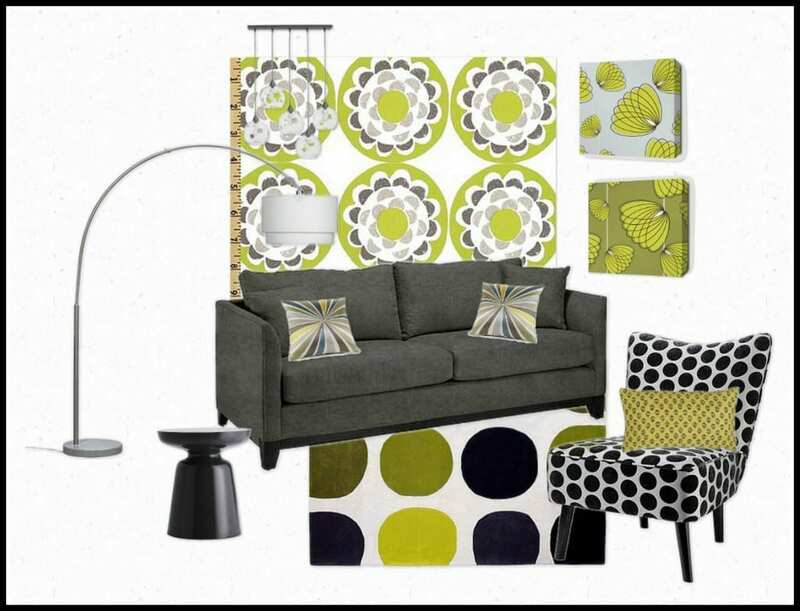 Why not have a go at creating your own mood board. Choose any room in your home and give it a new look. It might be your dream look, or a look that you’ve wanted to try for some time but don’t have the courage to. Be as bold or restrained as you like. Give it a go on the Oliboard Mood Board creater, (you just need to register your details first – it’s very fast) save as a jpeg and download it. Then send to me at jen@lovechicliving.co.uk and yours could be the next featured ‘Mood Board Monday’.